This question was a fun one to research. I am sure a lot of our readers remember the golden years of the space age and maybe even worked for NASA. 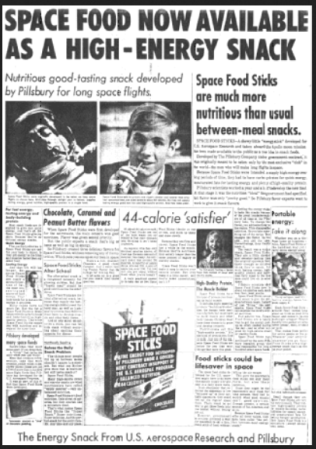 Below is a brief history of Space Food Sticks! Enjoy! In 1973, a version of SFS made its way on the Skylab 3 mission. The downfall of Space Food Sticks began after the energy crisis of the mid-1970s when the space program took a back seat to other pressing issues. The product's profile was further reduced when Pillsbury dropped the Space and distributed them as Food Sticks. The word energy bar hadn't been invented yet. Slowly but inevitably the fabled Sticks gradually disappeared from supermarket shelves. The second (and just as improbable) part of the story begins in the year 2000. That was the year that Retrofuture Products' owner Eric Lefcowitz launched his website Retrofuture.com. One of the articles on the site looked at futuristic foods including Space Food Sticks. Before long hundreds of Google hits were coming from curiosity-seekers searching for any info they could find on the unforgettable astro-snack of their youth. In 2001, Eric launched founded the "Space Food Sticks Preservation Society" at Spacefoodsticks.com. Thousands of heartfelt memories poured in which were posted on the site. Eventually the demand for a full-scale re-launching of SFS in the USA grew. After much trial and error, Eric joined forces with Mario Medri, a world-renowned food scientist and Kalman Vadasz of Richardson Brands to recreate the taste and texture of the beloved Sticks. Finally, in October 2006 two flavors of Space Food Sticks-chocolate and peanut butter-were launched by Retrofuture Products, satisfying the cravings of longtime fans and winning a new generation of Sticks fans in the process. Today, Space Food Sticks are sold at the Kennedy Space Center, Smithsonian Air & Space Museum, the Johnson Space Center, the Museum of Flight, Disney World, American Museum of Natural History, the Adler Planetarium and many other prestigious locales. Despite the odds, Space Food Sticks are alive and well in the 21st Century.